You got to THE END | Now What? How many people do you know who have written a novel or a handful of stories? Do you count only yourself? Writing is a singular endeavor, and it is doubly so when no one understands your compulsion. When you are in the middle of writing your first draft, it’s like standing in a stream. You can’t see the current, but you can feel it. This is the story flowing out of you and you should follow it. This is good work. You have found the sweet spot, the wormhole, into your story. I believe that all the novels you want to write are already written. They already exist inside you in a preverbal, rhythmic, motor place in your body. The trick is to find a way of tapping into them. Getting to this place can be elusive. Sometimes it happens early on in the writing process, sometimes very late; but once you find it, your story will flow out of you in a natural, organic way. The above italicized paragraph comes from Richard Skinner's great article from earlier this week called Know Thyself...By Writing Your First Novel. Read the article. I think you'll find it inspiring. If you're nearing the end of a project or have just completed a novel or several short stories, knowing what to do next in the absence of a critique group or formal workshop can be confusing. Do you put your novel or story in the drawer for six months and return to it later? Do you revise it immediately, and if so, how do you know where the soft spots are, where the opportunities for improvement can be found? Are you going to query agents or upload your manuscript to a self-publishing platform? Or send your short story to a batch of literary journals? If you'd like to talk about what to do next, contact us HERE and we can set up a time to talk on about where you are in your process. Maybe you're looking for a developmental edit on your novel, or an editorial letter for a few short stories. Maybe you'd like a coaching relationship as you chart a course toward your ultimate goal. At the very least, take a moment to read Richard Skinner's article and allow yourself to be okay with the uncertainty. That is where all writers live. You're in good company. We're so thrilled to have Kelly Luce join our staff at Writing Workshops Dallas! Kelly will focus on individual manuscript critique and editing, MFA application prep, as well as one-on-one coaching. She is the author of Three Scenarios in Which Hana Sasaki Grows a Tail (A Strange Object, 2013), which won Foreword Review’s Editor’s Choice Prize for Fiction, and the novel Pull Me Under (Farrar, Straus and Giroux, 2016), a Book of the Month selection and one of Elle's Best Books of 2016. After graduating from Northwestern University with a degree in cognitive science, Kelly moved to Japan, where she lived and worked for three years. Her work has been recognized by fellowships from the MacDowell Colony, Ucross Foundation, Sozopol Fiction Seminars, Ragdale Foundation, the Kerouac Project, and Jentel Arts. In 2015 she received an MFA in fiction and screenwriting from the Michener Center for Writers at UT Austin, where she was editor-in-chief of Bat City Review and the editorial assistant for the O. Henry Prize Stories anthology. Kelly's short fiction and essays have appeared in New York Magazine, The Chicago Tribune, Salon, O, the Oprah Magazine, The Sun, The Southern Review, New England Review, American Short Fiction, Gettysburg Review, and other publications. She is the Essays Editor for Electric Literature and was a 2016-17 fellow at Harvard’s Radcliffe Institute for Advanced Study. She lives in an old grist mill in Knoxville, Tennessee. If you're interested in working with Kelly, check out our Critique and Coaching page to get in touch with us or click on her picture above. You can also read a short piece Kelly wrote about reading for the O. Henry Prize Stories. We look forward to hearing from you! Winter 2018 Classes Now Enrolling! We're excited to announce our lineup of Winter 2018 classes! Fiction, Nonfiction, Screenwriting, and Poetry workshops are enrolling now and classes will begin in January. In the coming weeks we'll also confirm the dates for additional seminars for the winter term. 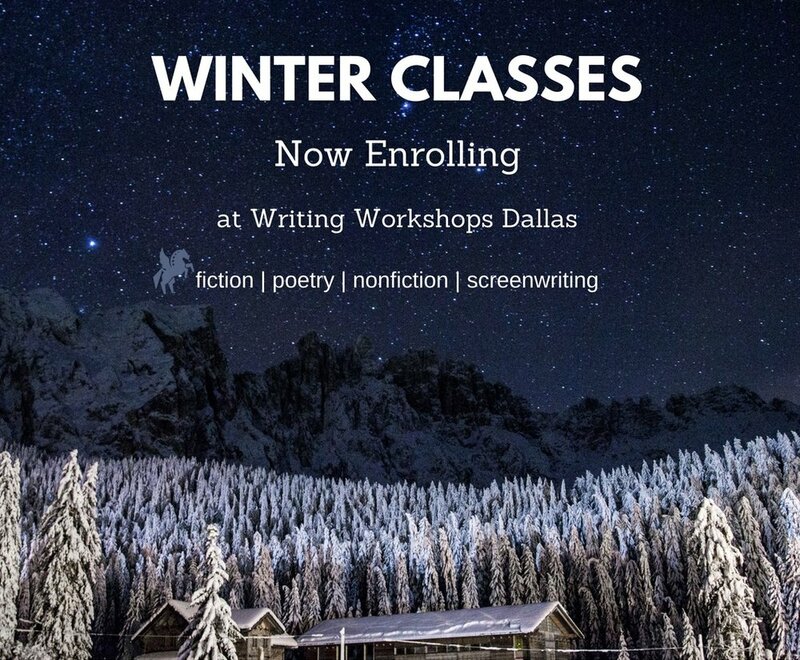 Writing Workshops Dallas also offers individual manuscript critique, MFA application prep, and one-on-one coaching services available via the Coaching & Critique link above. Click on the picture above for a full listing of our winter classes. You can also click the Contact link above to send our staff any questions you might have about winter enrollment or our editing services. We look forward to hearing from you!